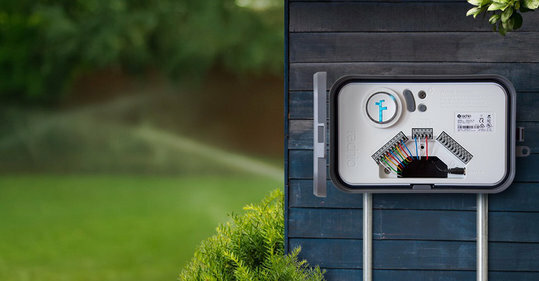 Whatever you call it, these devices are the electronic brains of your sprinkler system. Every sprinkler system has both an electronic power source and an hydraulic water source. RainBird, Irritrol, Hunter, Weathermatic, Toro, Imperial, Lawn Genie, Hardie, Richdel, Orbit, no matter the manufacturer, controllers do the same thing. The controller regulates the timing for when, how often and how long your system operates. Controllers communicate to valves in your yard which regulate various stations (or zones). The controller sends electronic impulses to the valves to engage them (open) or disengage them (close). When the valve is open, the hydraulic pressure rushing through the pipes pushes the heads up and water sprays! When the valve is closed, pressurized water remains in the mainline pipe, awaiting its next scheduled valve opening. Controllers vary in capacity (how many stations/zones they manage), features (14 day watering capability, rain dry out and more...), intelligence ("smart" controllers incorporate weather data & more to better manage watering) and battery backup (yes Virginia, your controller has either a backup battery or volatile memory to assist in the event of a power outage). Understanding what role your controller plays in the overall functionality of your sprinkler system helps you to better manage your system. New controllers are becoming available to homeowners, complete with wi-fi access via smart phones, tablets, and computers. WE have tested many of the controllers out on the market. The Rachio Iro is eligible for water bill rebates in McKinney, Frisco, Allen, and Plano. It provides real time data that adjusts or even skips a cycle if we have a freeze or rain. No more sensors dangling from your roof line that a squirrel chewed or the batteries stopped working. It works with many other devices that you might already have with home automation. Can't be home for a service call.....no worries give Heads Up temporary access and our crew can turn it on from our smartphone without having to go in the garage, making service calls even more convenient. Customer satisfaction. No more standing in a hot garage to program your controller! Protect your reputation by recommending the highest consumer-rated smart sprinkler - the only brand homeowners request by name. Rachio Weather Intelligence monitors local weather and automatically adapts to changing forecasts with rain skips and seasonal adjustments, in an effort to never water in the rain again. Saving water and money. Rachio works with top-tier home automation products like Amazon Alexa, Nest, Wink, and more. With Remote Access, best-in-class testing and certification, virtual controllers, and scheduling setup on your phone, Rachio was designed with the landscape professional in mind. In addition to these benefits, the Pro Edition Controller also features a 4-year extended warranty, available only with a ​licensed professional installation.